Our business was developed to help maintain all types of property whether you are buying, selling, renting out or staying. We will make your place MARKET READY. We take all of our jobs seriously whether it is a small paint job or huge flooring job.. Our company has over 16 years of experience and our staff is highly qualified and dedicated to meeting your goals and expectations. We price our products fairly and work hard to make sure that our customers get exactly what they need. Every member of our staff is experienced. We hold ongoing training and safety seminars to ensure up-to-date styles and techniques. Owner Dan Letzler makes it a point to visit each jobsite and discuss any questions or concerns with the client. We want to provide each of our clients with quality work at a great price. We know how important it is to have a good finished product which is why we take time on each job to prepare properly. We offer a wide variety of services, from installing new flooring throughout to just steam cleaning your carpets. We can paint your entire house or just paint one room. Whatever your home or business needs, you can call on us. Different members of our staff specialize in different fields and we always send the most experienced professionals that specializes in the specific job description. Our materials are bought from bulk from reputable manufacturers, allowing us to keep our prices down and quality high. If you would like a free estimate please email us at: marketreadyhs@gmail.com or call us at (513) 609-9240. Remember, preventative measures can help you save a lot of money in the future! 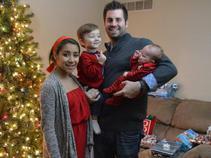 Owner Dan Letzler and his 3 children. Kaiya, Liam and Silas. Serving Destin, Orlando and Cincinnati. Now serving Destin Florida Orlando Florida and Cincinnati Ohio! !